1. Nobody asked how long I’d be staying in Canada. I was extremely nervous on my way in to Canada. 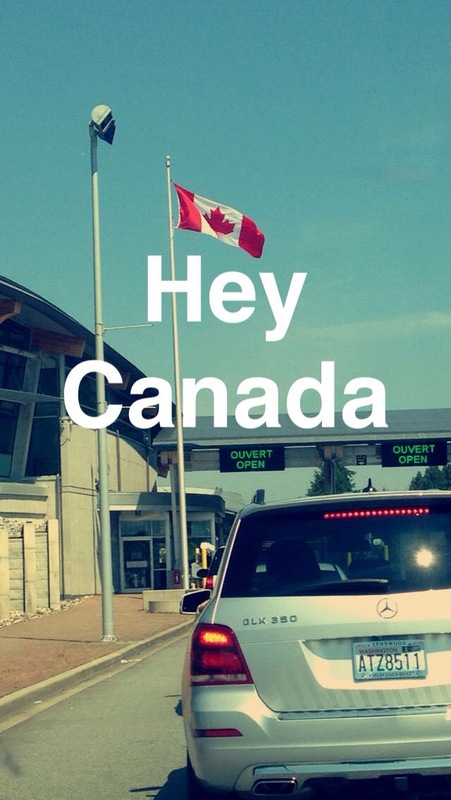 I’ve never driven across the border before and I kept worrying about “acting natural” despite having nothing to hide. The border official asked me a few questions I was expecting: where do you live, where are you going, for what purpose, are you bringing goods in, etc. Sigh. How do you explain that you have friends from YouTube without sounding sketchy? She got so distracted by my unusual circumstances that she never asked when I was leaving Canada. For all she knew, I could’ve stayed for a year. 2. I hit more yellow lights in 4 days than my whole life combined. Driving was my #1 biggest struggle in Vancouver. I expected some unfamiliar traffic signs (not to mention no sense of how large a kilometer is), but I discovered that even traffic lights could trip me up. Flashing green lights are common on large, multi-lane city streets. I know what to do at flashing red. I know what to do at flashing yellow. What on earth is flashing green supposed to mean? Thank goodness my Canadian friend showed me what to do–drive through like normal, but be aware that other cars are entering from side streets without a signal–but I never got used to the flashing green. Yellow lights, on the other hand, quickly became the bane of my existence. I’m not sure why, but I’m pretty sure I hit more yellow lights in those 4 days than I have in my whole life combined. Yellow lights require quick decision making: Am I close enough to just go through before it turns red? Should I stop? What will the driver next to me do? Why am I hitting every single yellow in Vancouver? And so on. 3. I tried to drive home at night without my headlights. The traffic lights weren’t my only driving folly. After a night in downtown shooting all the gorgeous city lights, my friend and I got in the car to drive back to her house. As we drove through the sketchier parts of Hastings Street, we started noticing people waving and gesturing to us. We had no idea why, but figured that they assumed my Prius-V was a taxi, since that’s a common cab choice there. I’d been driving without my headlights on and hadn’t even noticed because Vancouver is so brightly lit at night. Whoops. 4. Our tour guide could’ve been a clone of my ex-boyfriend. When I went on the Forbidden Vancouver walking tour, we had an awesome tour guide who truly made history come alive for us. He also made my personal history come alive–he looked and acted so similar to my first boyfriend (who I dated for three weeks when I was 13 and then dumped via text message) that I couldn’t focus. I struggled to take him seriously and look him in the eye because I kept having flashbacks to 9th grade. In one of his stories he talks about holding a woman’s hand, and he reached out to grab mine for the demonstration. By then I was seriously weirded out. Let’s just say it’s a testament to the quality of the tour that I stayed until the end. 5. I got chatted up during a photoshoot at the beach. I generally prefer to do my photoshoots alone, because I can be quite manic trying to capture every angle and every possible light source. I usually feel a bit self-conscious when strangers watch me work. But I won’t pass up a perfect spot just because I have company, so I tried to ignore the guy sitting near where I set up my tripod to capture the sunset at Locarno Beach. I spent about an hour running around the area, shooting everything I possibly could. Once the sun descended below the hills, I started to pack up my photo gear. I told him I wasn’t a local, but Vancouver’s clouds would make good sunsets. He asked where I was from, what I was studying in school, what sorts of shoots I’d been on so far. I’m an extrovert, so I like talking to new people, but he made such prolonged eye contact he made me kind of uncomfortable. He said he was headed to a bar and asked if I wanted to join him for a drink. I declined, partly because I didn’t get a good vibe and partly because I was underage, and cordially said goodnight. Even though he seemed a bit strange, I do give him props for not approaching me while I was working. I wouldn’t have been friendly if he’d interrupted my shot. Bonus: The saxophonist playing The Hokey Pokey. forget the first 5…..the bonus is my favorite. I had to slip him in somehow! I know your major reason for not agreeing to go for a drink was because you felt slightly uncomfortable, but are you underage to drink in Canada? I thought the age limit was 18? It certainly was in Toronto, Calgary and Banff My ex (with whom I went) was 19 at the time and nobody ever asked her for ID. This happened in May, when I was still 18. In British Columbia the drinking age is 19, and in fact it’s 19 almost everywhere except Quebec I think. Ah ok, thanks, maybe it has gone up since we went in 2002. I think so. Laws like that do have a way of evolving over time. Vancouver seems like quite the place…especially for you, it seems. :) I do love hearing about all your travel experiences there, that’s for sure! Heading to Montreal this weekend for a Canadian adventure myself! I’ll let you know if I encounter anything interesting. Ooh I’d love to go to Montreal. Canadian travel is one of my new priorities. I’m amused at all of this because of COURSE it all seems very Canada. Does it? That’s wonderful, Geoff. Wow – what a full adventure! Hahaha… the bonus! So fun. I’ve never been to Vancouver and really need to go since we are so darn close. The sunset shot is gorgeous. Glad you were able to work uninterrupted for a bit. Thanks Jenni–definitely give Vancouver a try! That subsequent photo is breathtaking. And thanks for reminding me memories are made not just on destinations and ahem food but also remembering fun quirks and misadventures! Thank you!! Yes, even when blogging it’s not just about the objective things-to-see, it’s about what happened. Ha ha! What an eventful trip! It does sound like you had a wonderful time, though. Both eventful and wonderful indeed! I really enjoyed my trip there, it’s a great place. I’ve been traveling alone since I was 14/15. My parents let me have a lot of freedom. And I’m 19 now, but at the time was 18–not yet old enough to drink in Canada. I’m a legal adult in the US but can’t have alcohol until age 21. The rules are plenty bizarre.